Marseille is an ancient port city in southern France with a population of just under 900,000 people. As the second largest city in France, it is a dreamy tourist destination and European cultural hub. Marseille boasts beautiful attractions that include the Notre-Dame de la Garde Catholic Basilica, the Old Port and lavishly decorated Marseille Cathedral built in the 1800s. Cheap flights to Marseille are now available for a limited time period, so prepare to be blown away by the beauty and intrigue the city has to offer! Marseille is home to the Marseille Provence Airport (MRS) also known as Aéroport de Marseille Provence. It is a 30-minute drive from the city centre and is located on the territory of Marignane. 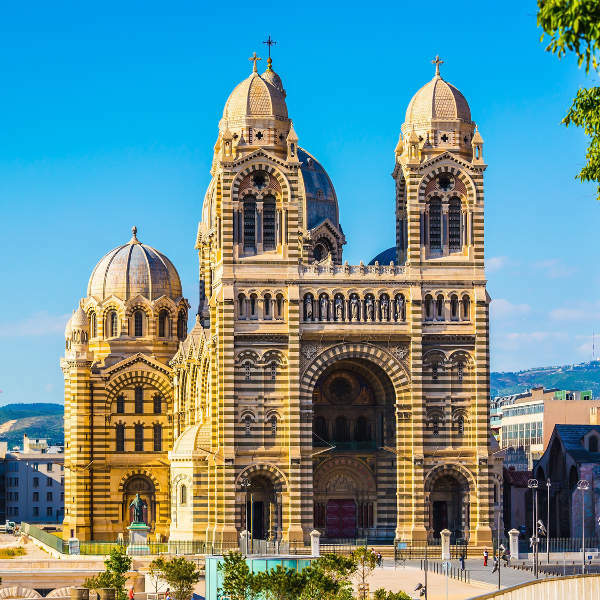 Take in the glorious sights of the beautifully designed and decorated Marseille Cathedral and the majestic Notre-Dame de la Garde Catholic Basilica, located at the highest point in the city. Stroll through the old yet charming streets of the Le Panier district in Old Town or visit the trendy and modern Cours Julien with its edgy street art and colourful culture. Marseilles’ beautiful Old Port hosts multiple, picturesque restaurants where you can enjoy traditional dishes like Bouillabaisse while taking in the amazing seaside and city views around the port. 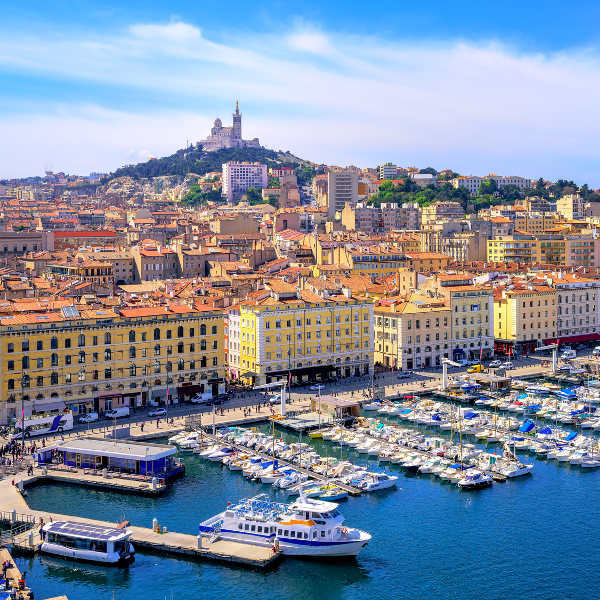 Known to be the sunniest major city in France, Marseille experiences a Mediterranean climate that creates humid, mild winters and dry, hot summers. If you prefer to explore the city in the heat of summer, the period between June and September is the perfect time to travel! Stroll through the tranquil streets of the Le Panier district in Old Town or discover the modern culture and trends found in Cours Julien. Summer is also the best time to experience the sounds of Marseilles’ annual World Music Day on June 21st. Locals commemorate this important date with multiple free concerts hosted across the city. If you are open to it, you can join in on outrageously exciting Gay Pride festivities in July or enjoy the famous electronic music festival, Marsatac, if you find yourself in the city at the end of September. December, January and February are the coldest months in Marseille but weather conditions will still be pleasant enough to tour popular attractions like Notre-Dame de la Garde or the Marseille Cathedral However, if you would like to avoid expensive rates while on holiday, visit during the shoulder-seasons of peak tourist seasons such as summer. Marseille, an ancient port city and ever-growing French tourist destination, is home to mesmerising architecture, beaches, culture and history. As the second largest city in France and a European cultural hub, this city offers beautiful attractions to explore. These include the majestic Notre-Dame de la Garde Catholic basilica, the Old Port and the lavishly-decorated Marseille Cathedral. The list of picturesque and welcoming bars and restaurants found throughout the city is endless. Discover the unique flavours of traditional cuisine like the seafood dish, Bouillabaisse, made with Marseilles’ freshest ingredients. Delight your senses with a drink of Pastis, a traditional alcoholic beverage made with aniseed and spice. The trendy Cours Julien city district at the heart of Marseilles will captivate you with its quirky and modern vibe. 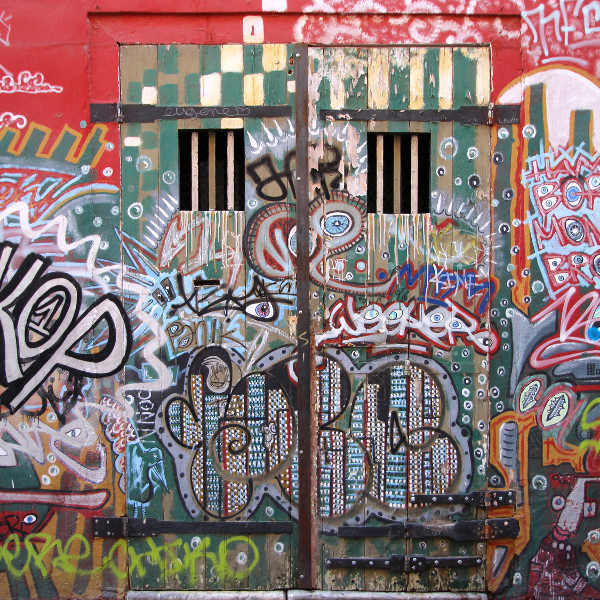 The building walls are filled with colourful, creative street art pieces that are constantly renewed by local and international talents. Explore the streets, art galleries, tattoo parlours, restaurants and bars that add an exciting twist to traditional Marseille culture. Compare several airlines, and book your cheap flights to Marseille online at Travelstart. Make sure your routine vaccines, including the MMR vaccine, DPT, Chickenpox, Polio and yearly flu shots are updated before travel. Depending on the details of your travel itinerary, some travellers may be required to get vaccines for Hepatitis A, B and Rabies. Practice common safety precautions such as keeping an eye out for petty crimes like bag-snatching or pick-pocketing, especially in the sub-way stations. Keep your valuables and important documentation safe. Women are particularly advised to be extra cautious in the city, especially if travelling alone.